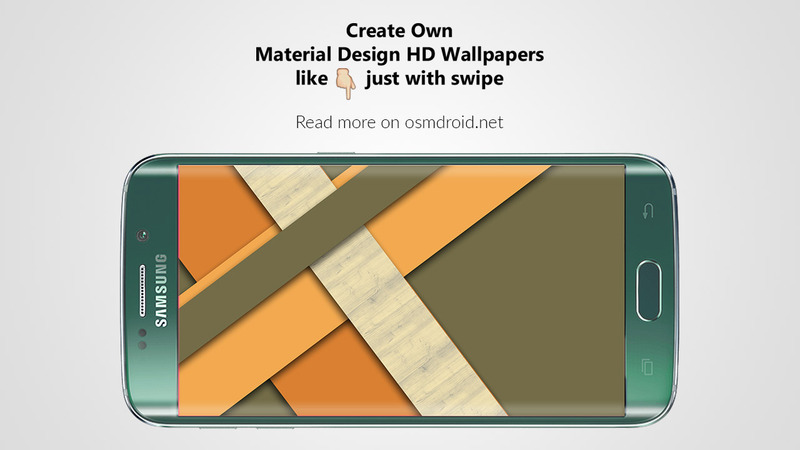 How to create own Material Design HD Wallpapers with swipe? In 2014 when google designers explained new design concept of “Material Design” everyone became fan of the concept and then day by day implementation of material design in apps websites and wallpapers increased significantly. We also became fan and love it. Material Designed stuff gives joyous feel to eyes . And android is known for its customization starting with custom launchers live wallpapers to icon packs and tons of other options. Androiders always have been decorating their homescreens and showing them off to others. Wallpapers are main element of homescreen especially when you want to match it with your setup. Homescreen setup become super-awesome when material design wallpaper of your choice of color with your icon pack and launcher combines. Features & Why is it Unique? * Wallpapers are generated according to your device’s screen resolution in highest possible quality which fits in your homescreen perfectly. * Usually all other wallpaper apps download wallpapers from internet servers and serves them in app but the uniqueness of this app is that app doesn’t even have INTERNET ACCESS permission which means it doesn’t download wallpaper from internet instead app generates by itself. * App also creates wallpapers with parallax effect and textures. * Infinite possibilities of wallpapers using different pattern and color combinations. * You can change pattern and color frequency depending on your taste. It is quite simple , you will just need android phone running JELLYBEAN 4.1 and up and you are ready to rock . 2) When launching app for 1st time it will show you tutorial. 1) You can download official app from play store https://play.google.com/store/apps/details?id=com.sharpregion.tapet which won’t have premium feature activated by default you have to PAY to get premium. 2) You can download latest cracked app from osmdroid.net/tag/tapet/ which will have PREMIUM features activated by default. Enjoy & share this tutorial if you like it. Have an Osm day. Share the post "How to make your own Material Design Wallpapers just with a swipe ?!"